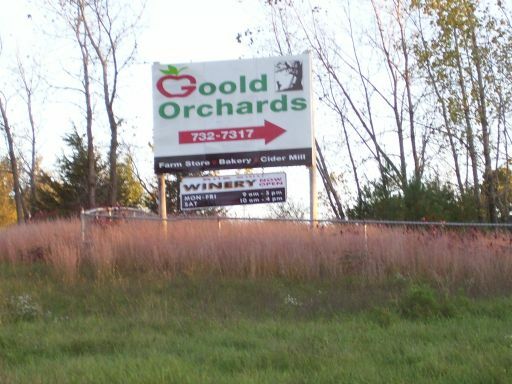 DIRECTIONS TO GOOLD ORCHARDS LOCATED 9 MILES FROM DOWNTOWN ALBANY ON THE EAST SIDE OF THE HUDSON RIVER IN THE TOWN OF SCHODACK. 3 MILES EAST OF CASTLETON-ON-HUDSON. Take I-87 south to Exit #7, Alt. RT 7 exit splits; signs read Troy & Watervliet. Continue on RT 7 to Exit for I-787 south to Exit; I-90 East to Boston. Continue on I-90 east to Exit 11E. Go to first Stop Light, and make a right on to Rt 150 south & west. Make your first left (S. Old Post Road). Follow to your next right Brookview Station road . This will bring to main entrance of the Orchard. Take I-90 to Exit 24. After you pay toll continue on I-90 East to Exit 11E. Go to first Stop Light, and make a right on to Rt 150 south & west. Make your first left (S. Old Post Road) . Follow to your next right Brookview Station Road. This will bring to main entrance of the Orchard. Take I-90 west to Exit B1. Continue on I-90 west toward Albany to Exit 11. Make a right at the end of the ramp on to Routes 9 & 20 south to the Stop Light, make a right on to Rt 150 south & west. Make your first left (S. Old Post Road). Follow to your next right Brookview Station Road. This will bring to main entrance of the Orchard. FROM: Points south, Downstate NY, Metropolitan NY or New Jersey. Take the N.Y.S.Thruway I-87 to Exit 21A (Castleton Thruway Bridge). Continue to Exit B1. Continue on I-90 west toward Albany to Exit 11. Make a right at the end of the ramp on to Routes 9 & 20 south to the Stop Light, make a right on to Rt 150 south & west . Make your first left (S. Old Post Road). Follow to your next right Brookview Station Road. This will bring to main entrance of the Orchard. Take the Throgs Neck Bridge to Hutchinson River Parkway to I-684 north to I-84 west to Taconic State Parkway North to the end. Then take I-90 west to Exit B-1. Continue on I-90 west toward Albany to Exit 11. Make a right at the end of the ramp on to Routes 9 & 20 south to the Stop Light, make a right on to Rt 150 south & west. Make your first left (S. Old Post Road) . Follow to your next right Brookview Station Road. This will bring to main entrance of the Orchard.